Looking to simplify your Facebook ad split testing? 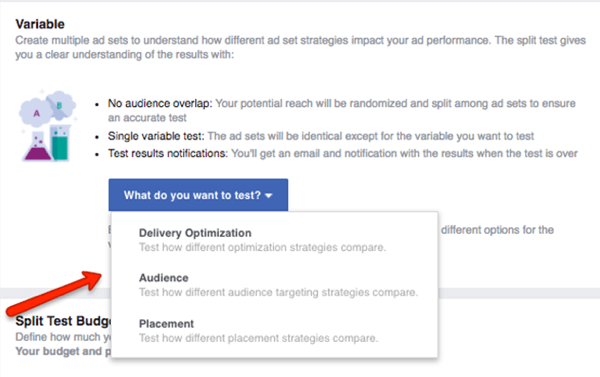 Facebook’s new split testing feature helps you identify which delivery settings, audiences, and ad placements give you the best results. In this article, you’ll discover how to set up split tests to improve the performance of your Facebook campaigns. 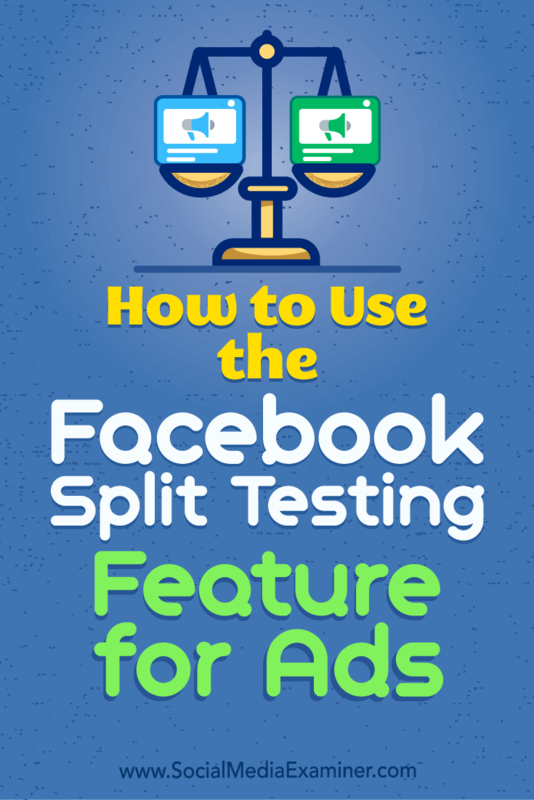 How to Use the Facebook Split Testing Feature for Ads by Jacob Baadsgaard on Social Media Examiner. If you’ve been advertising on Facebook for a while, you know it’s important to split test your ads and posts to analyze which ads deliver the best results for your business. Unfortunately, split testing can only teach you so much. If you split test two different types of ads and they both do poorly, do you just have two bad ads? Are you targeting the wrong audience? Are your bids too low? The list of potential questions goes on and on. Split testing can teach you a lot about your ads, but it doesn’t teach you anything about your overall marketing strategy. To learn about that, you need to test the who, where, and how of your campaign settings. Until now, there hasn’t been a great way to test these aspects of your Facebook ad campaigns. 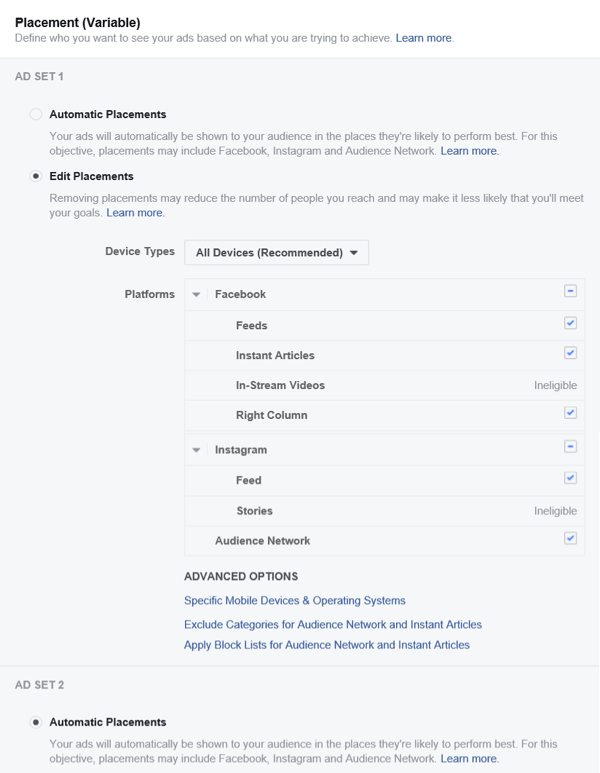 However, with Facebook’s new split testing feature, you can optimize your audiences, delivery settings, and placements to maximize your return on ad spend. Here’s how to get started. 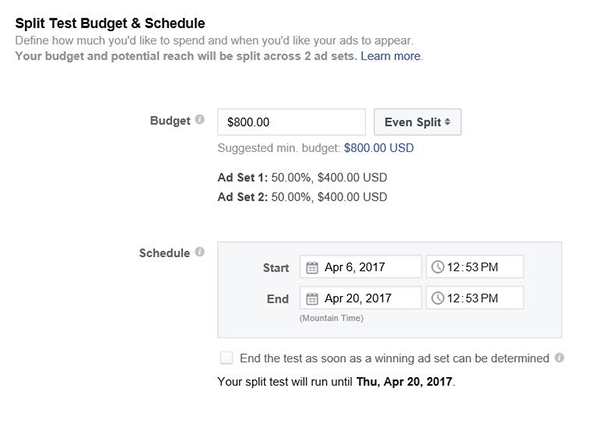 To set up your split test, head over to your Ads Manager account and create a new campaign. To set up your split test, start by creating a new Facebook campaign. Next, you’ll need to pick the objective for your campaign. If you’re trying to drive conversions, for example, click Conversions. Note that you can run a split test only with the Traffic, App Installs, Lead Generation, and Conversions objectives. Select the marketing objective for your campaign. Next, give your campaign a name and select the Create Split Test box. Then click Continue. Check the box to create a split test for your Facebook campaign. Select which variable to test in your Facebook campaign. Once you select a variable to experiment with, you need to decide what you want to test in that variable. Let’s look at your options for each variable. A delivery optimization split test lets you test different delivery options and bids. So if you want to know whether optimizing for link clicks or conversions delivers better results, this is the test for you. Similarly, you can try bidding different amounts for each ad set and see which performs best. 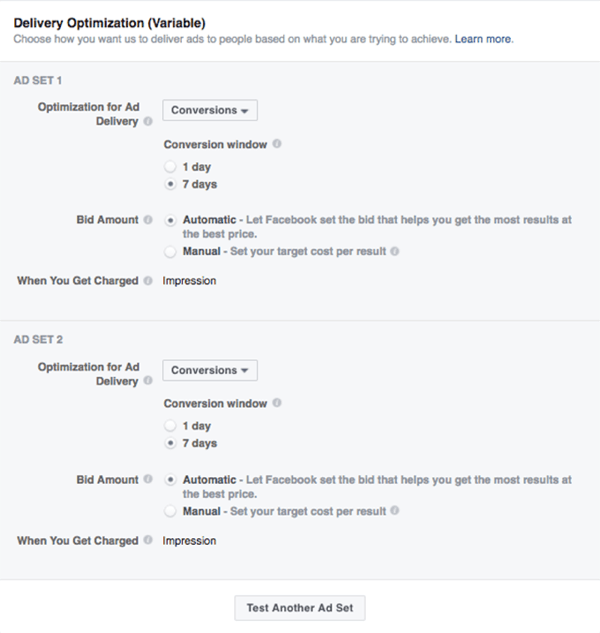 With a Facebook delivery optimization test, you can test different delivery options and bids. Remember, Facebook uses a different pricing model for different delivery options. Optimizing for link clicks uses a cost-per-click model. Daily reach, impressions, and conversions use a cost-per-impression model. Generally speaking, you want to keep delivery optimization tests as simple as possible. After all, if you test optimizing for impressions at a CPM of $50 against optimizing for conversions at a CPM of $500, and conversions delivers better results, you won’t really know which change made the difference. An audience split test lets you compare two saved audiences. To set up this test, all you have to do is pick your audiences. Pick two saved audiences for your Facebook audience split test. Before this update, you could test your audiences by showing the same ads to different audiences using different ad sets. However, that approach created a lot of internal competition. Why? Because typically there’s some overlap between audiences. If you target your ads to different audiences that include the same users, and one of those users clicks on your ad, it’s basically a toss-up which audience that person is attributed to. That doesn’t give you any helpful information about your audiences. For this reason, the old way of split testing audiences wasn’t the most reliable approach. With the new split testing feature, however, Facebook prevents crossover between your audiences, which makes audience testing easier and more accurate. Ever wonder if the feed or the right column delivers the best bang for your buck? How about iPhone users versus Android users? Running a placements split test can answer those questions and more. You can choose from a number of placements, including Facebook feeds, Instant Articles, right column, and others. Choose options for your placements split test. Of the three that you can test, the placements variable gives you the most options to play with. Often, where your ads are displayed is just as important as who’s seeing them, so this test could significantly improve your ads’ performance. To finish setting up your split test, scroll down to the Split Test Budget & Schedule section. Here you enter your testing budget and specify when you want your test to run. 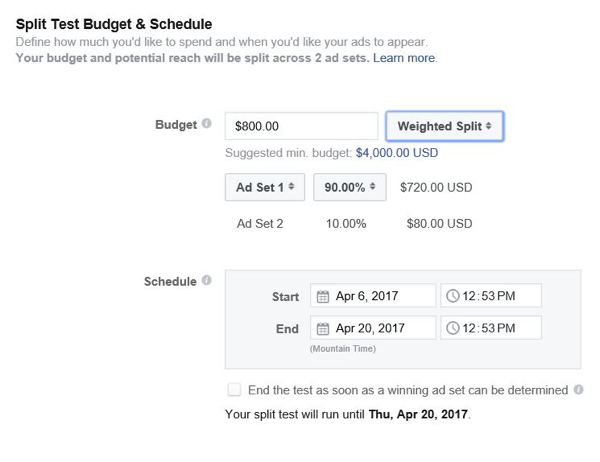 Facebook lets you choose how much budget each ad set gets. The default is a 50/50 split but if you click on Even Split, you can change to a weighted split test. The default setting for a split test budget is a 50/50 split. A weighted split can come in handy at times. For instance, if you’re comparing two audiences and clicks for your first audience cost 5x more than clicks for your second audience, you might want to give the first audience 80% of the budget. That way, you’ll end up with about the same number of clicks in each ad set. Select Weighted Split from the Even Split pop-up menu. On the other hand, maybe you’re confident the right column will deliver significantly fewer conversions than the feed and you don’t want to spend 50% of your budget proving it. In this case, you might want to allocate 90% of your budget to the ad set that shows ads in the feed. In general, though, it’s best to stick with the 50/50 split option. In most situations, it will give you the best data and allow you to confidently compare your results. As you pick your testing budget and duration, keep in mind that you have to spend at least $14 and run your test for 3 to 14 days. I recommend picking a budget that will get you at least 100 clicks in each ad set and scheduling your test to run for 14 days. That way, you’ll have a good shot at getting useful data from your test. And that’s it! You’ve set up your split test. From here on out, it’s business as normal. Click Continue, put your ads together, and launch your test. 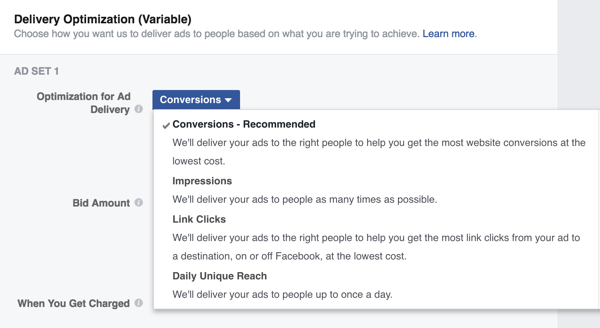 Facebook lets you control how much budget to allocate to each ad set. 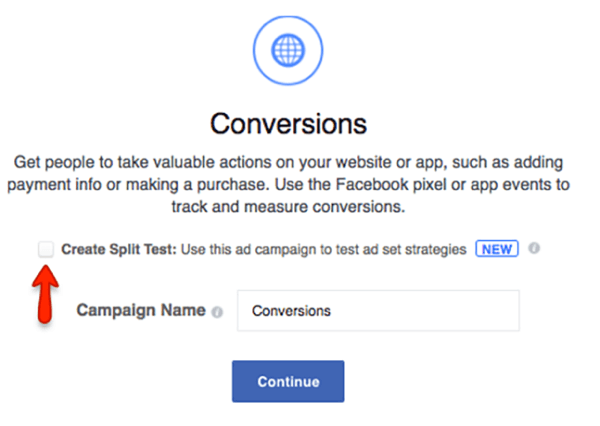 You can use Facebook’s new split testing feature in a number of ways to improve your campaigns. To help you get started, here are a few testing questions to consider for each variable. Does audience A or audience B have a higher click-through rate? Does audience A or audience B have a higher conversion rate? Does audience A or audience B have a better cost per conversion? Which Optimization for Ad Delivery produces the most conversions: Conversions, Impressions, Link Clicks, or Daily Unique Reach? Which Optimization for Ad Delivery produces the most clicks: Conversions, Impressions, Link Clicks, or Daily Unique Reach? Does automatic bidding produce a better cost per click than manual bid X? Does manual bid X produce a better cost per click than manual bid Y? You can choose from a number of Optimization for Ad Delivery options for your delivery optimization split test. Sometimes one audience will deliver better results when you optimize for conversions, while another audience will produce the best results if you focus on impressions. These delivery optimization tests will help you decide which settings to use for each audience. Does this audience respond best to ads on Facebook or Instagram? Does this audience respond best to ads in the feed, right column, or Instant Articles? Do iPhone users or Android users respond better to my ads? You can test whether iOS or Android users respond better to your Facebook ads. It might take several tests to answer all of these questions but just imagine what you’ll learn about your audiences! If you want to get the most out of your Facebook ad campaigns, you need to do more than just optimize your ads; you need to optimize your campaign settings, too. 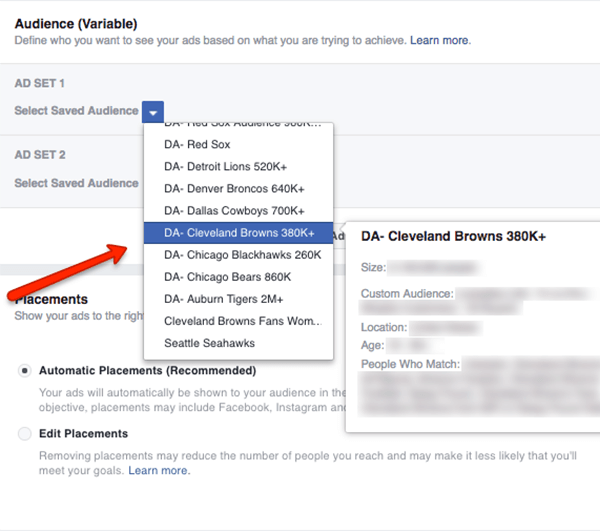 Facebook’s new split testing feature makes it easy to learn how different audiences, placements, and delivery settings affect the performance of your ads. As a result, you’ll be able to answer a lot of questions about your target audience and maximize the performance of your campaigns. What do you think? 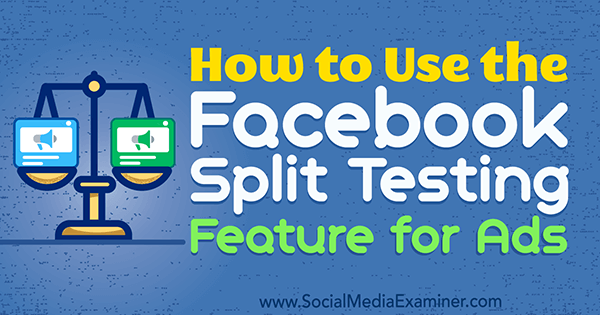 Will you try Facebook’s new split testing feature? How do you optimize the performance of your Facebook campaigns? Please share your thoughts in the comments below.